Another Saturday and another Bangalore SQL UG meeting completed! The turnout on a Saturday morning was really good. This time around the event was a bit different as we had a session on Photography by Vijay [T: @msigeek | B: iClickD]. This week’s User Group meeting was dedicated to SQL Server Tips and Tricks with Balmukund Lakhani [T: @blakhani | B: sqlserver-help] and me presenting on Management Studio and Power Pivot and Power View in Excel 2013. Balmukund’s session as always was a superb hit where he demonstrated more than a fair share of SSMS tips and tricks. I am sure every one at the event learnt atleast a new thing about SSMS. There are multiple hidden options under the Tools->Options view in SSMS. Vijay delivered a great session on photography which was very well appreciated by the audience!! My session was around the the usage of Power View and Power Pivot in Excel 2013. I demonstrated how easy it was to build visualizations with Excel 2013 for administrators. I also demoed the Excel sheet that I had created using the System Health Session data. All my blog posts on this topic are available below. The Excel file can be downloaded from Sky Drive using the link: http://sdrv.ms/10O0udO The presentation that I used for my session is available at SlideShare and also embedded below. In the last post for this series, I had explained how to retrieve the I/O statistics from the System Health Session data. In this post, I will describe how to build a dashboard using the SYSTEM component of the sp_server_diagnostics output. This view will help DBAs track various errors which can get their blood pressure shooting to abnormal levels. The SYSTEM component tracks various errors like non-yielding conditions, latch related warnings, inconsistent pages detected and access violations for the SQL Server instance. Armed with this information in a Power Pivot table, I created two calculated columns for DAY and HOUR on the time the event was reported. After that I created KPIs on the maximum number of non-yielding conditions, latch related warnings, inconsistent pages and access violations reported. Now that I have my Power Pivot data, I created a new Power View sheet which tracks the created KPIs for each day and hour. The screenshot below shows the final view. The first half is a 100% Stacked Bar graph showing the various errors that were reported each day. There is a slicer for Day available which allows to filter the data quickly. The second half of the report is a matrix which shows the KPI status for which day with a drill-down capability for hour. 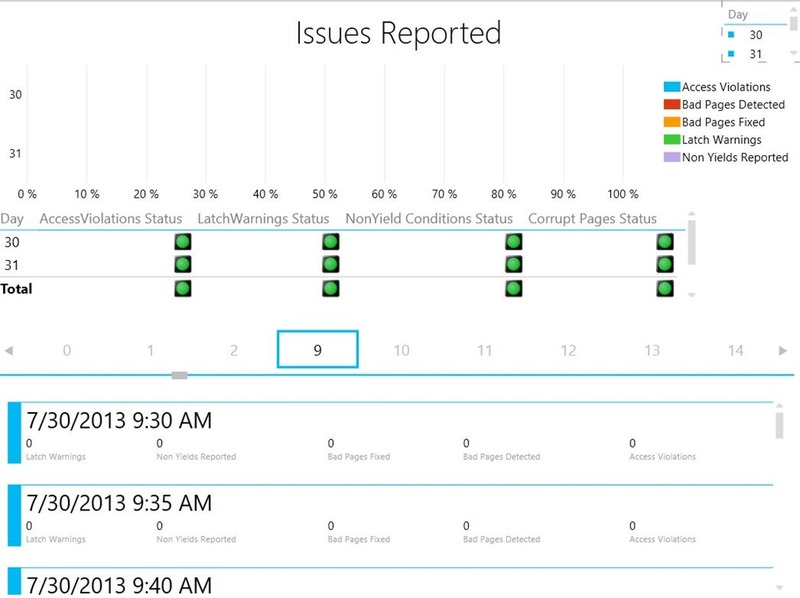 The third half of the report shows a card view with the actual number of issues reported for each event against a particular time. The query to fetch the data required to build this report is available below.